The Sudbury Writer’s Guild is pleased to announce the publication of our first collection of writing by Guild members entitled SUDBURY, INK. It offers something for everyone: humour, romance, history, science fiction, and more.The anthology features 33 pieces from 17 contributors in a variety of writing styles, topics, and genres—both prose and poetry, fiction and non-fiction. Rosanna Micelotta Battigelli—whose historical novel, La Brigantessa, is being published by Inanna Publications in 2018. The anthology will be on sale during the WORDSTOCK SUDBURY literary festival (November 3 to 5, 2016) for a special ‘event price’ of $15.00. The book will be available for purchase at BAY’S USED BOOKS as well as CHAPTERS and COLES—Sudbury locations only—for $20.00 after November 5th. You can also order books via the Guild website for $15 plus shipping. We can only accept payment via PayPal, E-Transfer, or cheque. Use the CONTACT US form at the bottom of the website to enquire about ordering books. An official launch will be held Saturday November 12 at the Main Branch of the Sudbury Public Library between 1 – 3 pm. The public is welcome to come out and meet some of the authors and listen to them read from their work. Books will also be available for purchase at the launch. Andy Taylor, October 24, 2016. 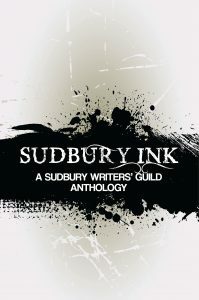 No Comments on Announcement: Sudbury, Ink – The Anthology.Category: News, Sudbury Writers' Guild Events. Tagged: Anthology, Book Launch, Press Release, Sudbury Ink, Sudbury Writers Guild.